Wednesday the 27th of April marked the 22nd year of Freedom for South Africans. The early hours of the 28th of April 2016 marked the day I lost my cousin. The afternoon of the 28th of April 2016 my Lil Kbear officially turned 2years and 8months old [32 months old]. Mixed emotions? Plenty! Let’s start with Freedom Day. Honestly I wasn’t going to say much about this. I don’t have much to say, after all I am only 3 years older than Freedom in South Africa. But it would not be fair for me to not say anything. I was born during the very end of apartheid and as such I did not experience it. I have no memory of era; nothing whatsoever of what that felt like. But my parents do. My friends do. My Colleagues do; in fact many other people do. For them the wounds have healed but the scares are still fresh. They remember those days like it was yesterday but above all, they remember and embrace forgiveness. We live in a changed South Africa. One where there’s peace and harmony. At least i’d like to believe so 🙂 . In the early hours of the morning of the 27th of April…..Okay wait, it really wasn’t that early….I went into the City of Johannesburg or as we call it Down Town Joburg. I have no idea why I did that, but I did anyway. The city was buzzing with songs of the struggles, people were singing and dancing. Whistles were being blown from all angles and the vibe was just good. And in that moment, I almost understood what it was like during those times and I could almost see how far we have come. We live in a BEAUTIFUL Country, filled with BEAUTIFUL people and for that I am grateful that we have come past the apartheid era. I will never fully understand what it was like but I won’t ever stop appreciating what it is like now. Now, about the more sad news. My Dear Cousin, taken from us too soon. At only 26, with a very young Daughter, we did not see this one coming. It’s funny how overtime when a person says life is too short, we just don’t listen. It’s really not that we don’t want to, but simply that we can’t relate to the situation. One can never understand this until you experience it. I got the news at 2am in the morning and I could not sleep until 5am. Yes, it was a very long day at work! I kept thinking about her Lil Girl. I kept wondering what would happen to my my Lil Girl should I die now. Honestly, I still don’t know. These are all such difficult questions that needs to be addressed sooner rather than later. But for now, I will mourn my Dear cousin who will be dearly missed. And of course I saved the happier story for last. Kbear is 32months old….Wait, does this mean that she’ll be 3years old in 4 months? Can somebody please just press pause on this time? Please! My cute lil munchkin is growing up too fast but I wouldn’t change it for anything. She’s more sociable, confident, and way too energetic. It doesn’t help that I gave her cake just before bedtime but it was the 1 day in the month where she gets to eat cake like that. We sat as a mini Family [Myself, Her, and Her Daddy], sang a BirthDate song and ate the cake together. It’s such a small thing and yet so precious. I would not trade this for anything. Anyway, I hope you have enjoyed reading this very random post. Too many things happening all at once and I just needed to share the Joy and Sadness that i’m feeling right now with someone. 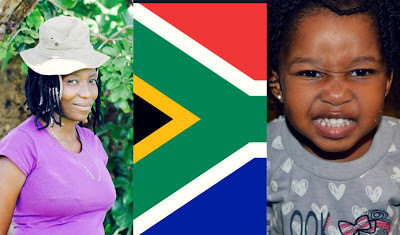 Let’s chat up in comments below about your take on Freedom Day. Do you feel South Africa is heading in the right direction freedom wise or do you foresee a disaster ahead? Until next time, hope you had a wonderful Freedom day.